Robot Master is a 2 player Reiner Knizia game. One player plays horizontally with the rows and the other player plays vertically with the columns. 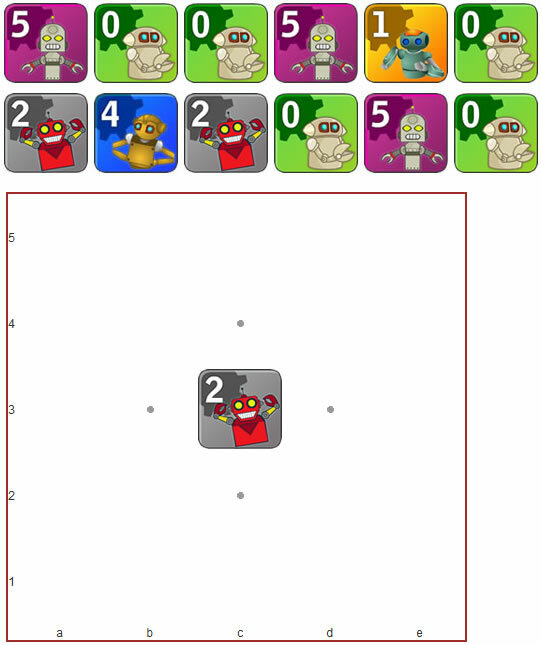 The objective of the game is to optimize the positions of the robots such that at the end of the game, the loser will be the player who have their row or column with the lowest score. In total there are 36 "Robot" cards (values 0-5, each 6 cards). Both players get each 12 random cards at the start of the game. One random card is turned face up and put in the middle of the table. Below an example of the starting position. The players take turns, one player plays with the rows (horizontal) and the other player with the columns (vertical). When on turn a player has to select one of his cards and place it on the table. The card must touch cards (horizontally or vertically) already on the table. 1 Robot card alone counts only for its face value. 2 identical robot cards count for 10 times the face value of the cards. 3 identical robot cards count for 100 points (regardless of face value). 4 or 5 identical cards count for 100 points for the first 3 cards plus the unit value of the remaining cards. Note: 1 or 2 "0" cards is 0 point, but 3 "0" cards is 100 points! Below an example of the score is given for a finished game. The game finished when all cards are placed forming a square of 5x5. The player with the lowest score for their row or column loses the game. 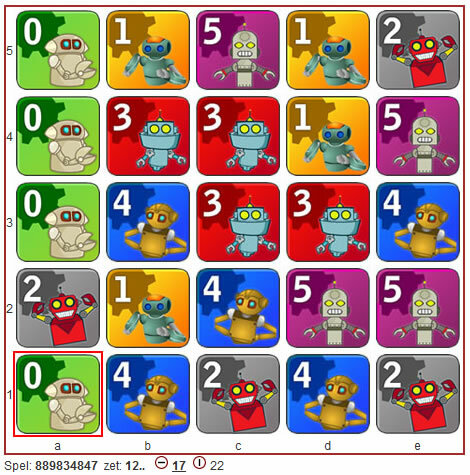 In other words: for every player the lowest row or column is calculated and the winner is the player with the higher score. In the case of a tie, the second lowest row or column is considered. Below an example of the score is given. The lowest row value is 17 and the lowest column value is 22. The player with the columns wins the game.